Reef fishing and light tackle fishing in the Bahamas are the perfect ways to get out to the calm waters of the islands and try your hand at the exquisite fishing opportunities available out of Nassau, Bahamas. Fishing in the Bahamas is one of the island’s top activities. This is due in part to the sheer abundance of fish species that live in the waters that surround the Bahamas, and also due to the fact that conditions for fishing in the Bahamas are typically quite favorable for anglers. This combination makes fishing one of the main reasons people come to the Bahamas from all over the globe. While offshore fishing might be the type of fishing that is most popular with visitors, reef and light tackle fishing offers guests a different type of fishing experience that is calmer but just as fun and rewarding as any other type of fishing. 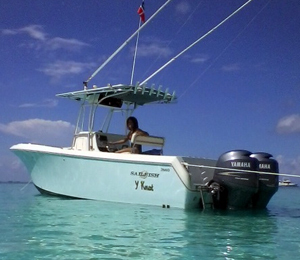 Our team on the Y Knot is part of one of the top fishing teams anywhere in the Bahamas. Based out of Nassau and with decades of experience fishing these waters, your captain and first mate will be ready to take you on the ultimate of Bahamas light tackle fishing trips. We will provide you with all necessary gear as well as instruction. Even if you are a complete novice to light tackle fishing, our team will be on hand to show you the best techniques to snag that perfect catch! Before you know it, you will be reeling in a massive grouper, or a Jack Crevalle, or some of the dozens upon dozens of species that live in the shallow coral reef ecosystem of the Bahamas!